Renovations - What approval if any do I need? When considering renovations to your lot you need to understand what approval (if any) you require from the owners corporation. The Strata Schemes Management Act 2015 [NSW] and the Strata Schemes Management Regulation 2016 [NSW], introduced a number of changes that will allow owners to carry out works involving common property where a by-law is not required and in some cases, without the approval of the owners corporation. 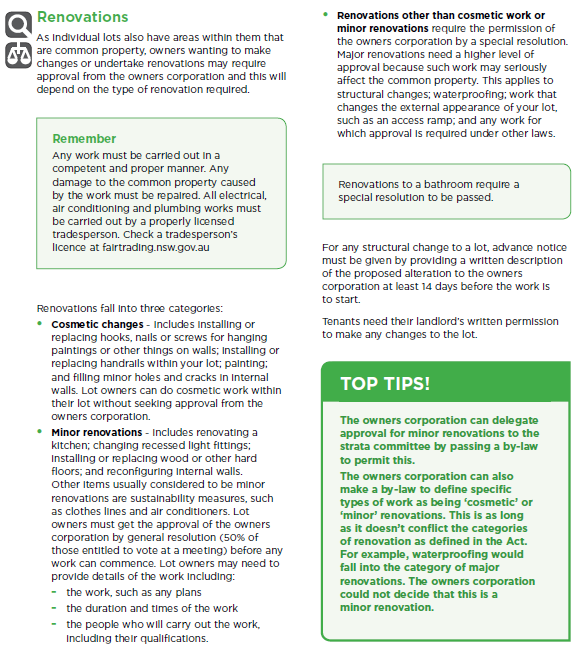 The new legislation provides for three ‘tiers’ or types of works with different levels of approval required. The three tiers of approval of works are Cosmetic, Minor and Major. A lot owner effectively owns the airspace (and anything included in the airspace) inside the boundary walls, floor and ceiling of the lot. Lot airspace may include balconies and courtyards. Everything within the airspace must be maintained at the owners cost. In most strata schemes, the lot owner owns the inside of the unit but not the main structure of the building. Usually the main walls encompassing the lot, the ceiling, roof and the floor are common property. The internal walls within the lot (eg. The wall between the kitchen and the lounge room), floor coverings such as carpet and fixtures such as baths, toilet bowls and bench tops are all the property of the lot owner. 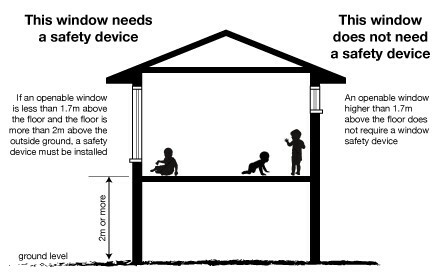 It is also important to note that while no-load bearing internal walls are not defined as common property, a Council Development Application (DA) may still be required where you are changing the dimensions of any room. The Council Development Application requires approval by the owners corporation. Section 108 of the Strata Schemes Management Act 2015 provides that an owner of a lot can add, alter or erect a new structure on common property following approval by special resolution at a general meeting. Any proposed renovations to a lot that involves additions, modifications or potential damage to common property must be supported by a ‘Common Property Rights’ By-Law which is approved by special resolution at a general meeting of the owners corporation. If the alteration affects common property, a ‘Common Property Rights’ By-law must be drafted (preferably by a solicitor approved by the owners corporation). · That the ongoing repairs and maintenance of the works completed and any part of the common property impacted, remains with the lot owner, both current and future. · That the Owner is responsible for reinstatement of any damage to common property. · That the Owner indemnifies the owners corporation against any legal liability, claim or cost in relation to the works and ongoing maintenance or matters arising relating to the works. o Transportation of all construction materials, equipment, debris and other material will be managed to ensure no damage to the common property or in a manner reasonably directed by the owners corporation. o All areas of the building outside the lot will be protected from damage by the works or by the transportation of construction materials, equipment and debris in a manner reasonably acceptable by the owners corporation. o The lot owner will comply with the requirements of the owners corporation to comply with any by-laws and any relevant statutory authority concerning the performance of the works. The ‘Common Property Rights’ by-law must be presented at the general meeting as a special resolution. For a special resolution to be passed, no more than 25% (of the aggregate unit entitlements) of lot owners who are entitled and voting on the motion can vote against the resolution. If the motion is passed arrangements need to be made to have the by-law registered within 6 months of the passing of the resolution, otherwise the decision is considered lapsed and the motion would need to be passed again at another general meeting. Any owners who fail to follow the correct procedures run the risk of having orders made for the reinstatement of common property to its original form. In the first case for all renovations speak with your Strata manager first. Vital Strata have a comprehensive application process for lot owners renovations and can guide you through the approval process. We are excited to announce our new venture - Vital Strata Management. A boutique agency delivering smart and simple solutions through personalised service and expert advice. There is a common perception in the strata Industry that Strata Management companies are the same. In talking to many people it seems to be a case of - "its better the devil you know"
Vital Strata was launched with the view of providing real personalised service to clients. Our aim is to work with owners on a personal level to achieve their property goals.